An extremely humid day for those out at Wall Speedway, for the second day of Round 3 - The Gauntlet. As the morning kicked off with practice, the stadium was soon filled with sounds and smells that hit straight to the senses. Throughout the day the crowds poured in through the gates to watch what would surely be tough battling between the thirty-two competitors down on the track. Smoke filled the air as the last few head off the track in time for the battles. 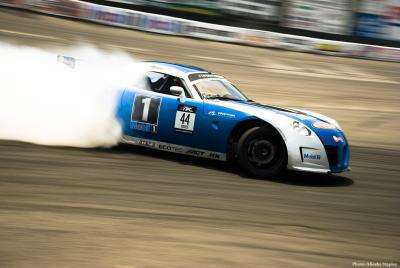 First up is five year pro Ryan Tuerck drifting the Mobil 1 Pontiac Solstice pumping out 500HP with the Ecotec engine. His challenger for the morning; Andrew Picard and the teams Dodge Viper who qualified thirty-second. From day one, Tuerck showed great power becoming the day's top qualifier. It's no surprise he kept the rhythm through to day two, taking the first win of the day. 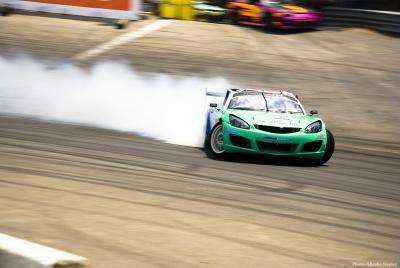 Screaming from beyond the pits and out comes Dean Kearney, smoke billowing from the tyres. Another rookie of the year in his first year of competition in the USA. Teaming up with Intec Racing this year in his Nissan S-14. Tires all warmed up and ready to go; he awaits his competitor. With a stunningly colourful Nissan S-14; sporting Gram Light 57d luminous yellow rims inside Nitto NT05 tyres, it is truly a match of the Nissan's. Matt Power and the Mattley Crew packing a punch but falling short of Dean and his sight on the rookie of the year title. 1-0 to the rookie. 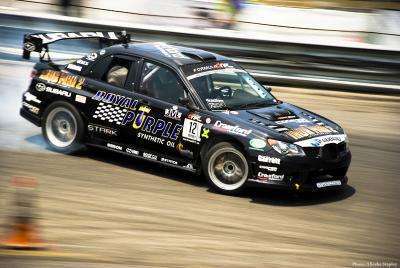 A favourite amongst the Subaru fans; Stephan Verdier and 2006 Cooper Tires Subaru STI with 520hp, 550 torque. A sleek black machine with enough aerodynamics to slice into those corners with speed. Voted most improved driver for a second year in a row, it definitely showed out on the track. Had he met his match with a 2004 Ford Mustang driven by Doug Van Den Brink? A quick drift of two laps and it was all done and finished. 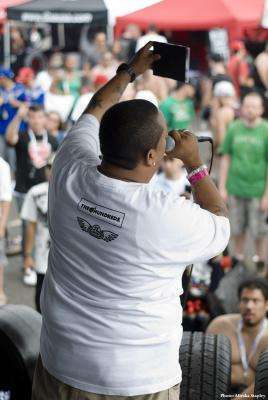 Brink returned into the pits of D'vanz Motorsports; placing the car on show & chatting with fans. A loss but there's always next time. Anticipation rose through the drivers tents as the morning continued, one person in particular; Cyrus Martinez. A rookie in his 240sx going head-to-head with ninth qualifier Tanner Foust in his Scion. The young Californian male psyching himself up before the battle with a familiar saying "Its all in the mind". 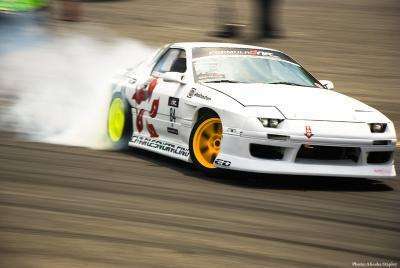 The 240sx only pulling half the power of Foust's Scion which contains a TRD NASCAR Phase 9 engine, pulling 800HP. He put up a good show with a hard decision for the judging panel. A re-run was in order. But it wasn't enough to win over the judges with Foust grabbing the win in the fourth battle of the day. The last chance for 'Megan Racing' due to Aono Taka's AE86 Hachi & transmission issues the first day into the championship, an unfortunate circumstance for the team. However, spirits were still strong as they gave their support to the other teams throughout the rest of the day. Fifth battle of the day as the heat rises and its Euro vs American muscle. The heat isn't the only hot part of the day; Justin Pawlak behind the wheel of team Falken Tire, 2010 Ford Mustang GT. Up against Michael Essa; the man known as 'Aggressive, Precise, and Always Pushing the Limits!' - [Quoted from FormulaD]. The usual car driven is the 1987 Mazda RX-7 however, something new has been born from team GSR Autosport; BMW 305R. Through these strong passions, was a wonderful performance and display. 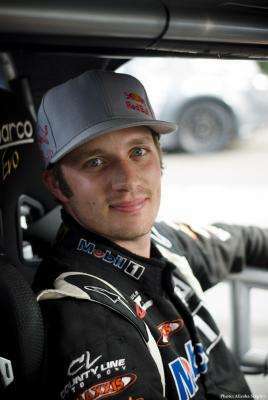 The result: Justin Pawlak. The day continued with the the battles getting stronger through each pair. But with good also comes the bad. Flying tyres, ripped rear bumpers, whatever can rip you name it. An unfortunate event for Rhys Millen driving the RMR "Rhys Millen Racing" Hyundai Genesis Coupe on the second lap against Samuel Hubinette and the teams 2010 Dodge Challenger. 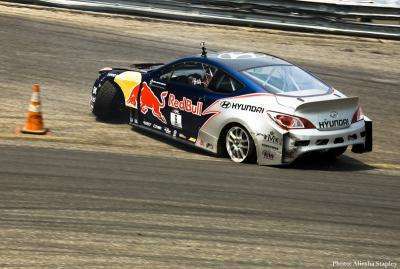 In front and banking too close to the outer lip of the track, the left side of Millen's Hyundai pulled up onto the top, sliding the car up against the guard rail. Not being able to hold the car from the hit, he spun downwards towards the middle of the track before coming to a complete stop. The left front wheel on full lock sticking outside the guard, the back covered in scratches and the rear left rim stripped off the tyre tread. This was the second incident for Millen in this series. Half time break came around quickly, with the crowds flocking through the tents; chatting amongst themselves about the displays of showmanship they had just witnessed. 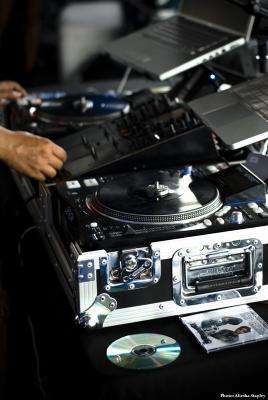 Music, videos, DJ's, the pits livening up with cheers and the smells of freshly made hot dogs. Returning back to the stands and it was time for business! As another rookie in the season; Charles Ng was becoming a strong competitor amongst the pack. He's a rookie that will do his best to see how far he can go. So far he is now the leading the rookie of the year, standing 18th overall. He strives to achieve higher; and many will be looking forward to seeing how far he will go in the future championships. Daijiro Yoshihara. The cars being driven by these skilled drivers; 2009 Scion tC RWD, 2011 Ford Mustang, 2007 Saturn Sky & Daijiro choosing a different car this season with a Nissan 240sx S13. Heated as much as the day was and ultimately close calls! Tanner Vs Vaughn; with Vaughn snatching up the win. Darren Vs Daijiro; just not enough to keep up with Daijiro. The last and final battle of the day where it all comes down to it. 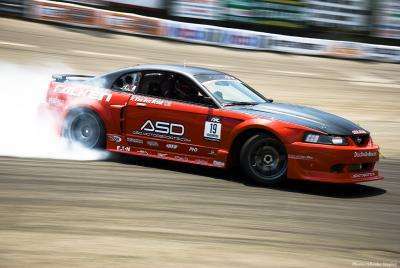 The winner would be determined between Vaughn and Daijiro; Mustang against S13. 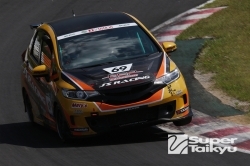 With a highly competitive battle between an iconic figure and a drift veteran, it all came down to Daijiro Yoshihara taking the title of first place, with Vaughn taking second. The strong emotions up on that podium were sewn on the faces of each of the winners as well as those in the crowd. But not everything was about winning that day. The emotions and passion for the sport, as well as the hardships shared between each of the team members getting through to first place is more stronger than an empty cup; however it is the evidence we have along with photos and video to show what each have gone through to get there.